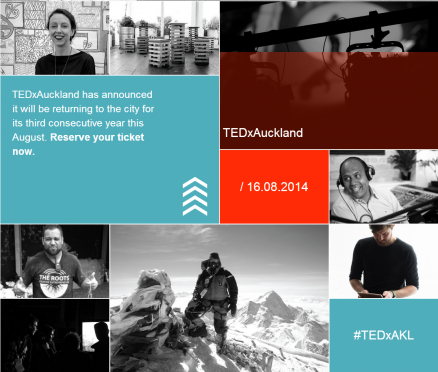 TEDxAuckland ran from 10am to 6.00pm on Saturday 16 Aug 2014: 8.0 hours of awesomeness. But my day started at 6am because I drove up from Tauranga for it, and got back home at midnight. I’m still counting the 5 hours driving because those were awesome too. I was either talking to my car buddies Michelle Herrick, Chris Turner and Annabel Davies about our work, family, lives, dreams and aspirations. Or, chatting to new people we met during the day and catching up with friends. I’ve watched just over 1000 TED videos now (5 per week for 4 years), but to have the speakers right in front of you, really engages your other senses and drives the content and their message into you. My philosophy is that 50% of the value of any event/seminar/conference/expo you go to is the content you are exposed to, and 50% the people you meet before, after, and during the breaks. I just ran my biggest TEDxTauranga event 4 weeks ago for a sell out crowd of 500 people, and I’m always on the hunt for ideas we can apply to a bigger and better event next year. On to the talks for TEDxAuckland. Don’t take my rankings too seriously. The magic of a TEDx event is that there is variety built-in so that the person next to you can enjoy the exact opposite talks that you enjoy. Mike’s message was that you can accomplish extraordinary things, all you need is a strong plan and to break it down into small steps. He started by telling us the startling story of his first plane crash into the sea, the impact was so great, his clothes were blown off his body, but he survived. Air New Zealand pilot, Everest mountaineer, adventurer and extreme marathon competitor, Mike is an ordinary family man proving that anybody can accomplish extraordinary things. Life took a dramatic turn when a flight from the USA to New Zealand led to a crash-landing into the sea off the coast of Hawaii in the dark of night. Mike harboured another ambition – to stand at the top of Everest and, true to form, he conquered this goal in an unguided expedition. He has since gone on to conquer numerous other mountains. He’s also one of a handful of athletes who have ever run 7 marathons in 7 days on 7 continents. Riley loves sharks. Sharks are essential. Sharks don’t need to be feared. Blue Sharks are hunted in New Zealand waters and fishing them was due to be banned in 2016. That wasn’t good enough for Riley and so through his efforts the law will change 1 Oct 2014 instead. Lesson for me: If you want to change the world, don’t just sit at a desk and write academic papers that might not see the light of day, get out there, take journalists with you (in his case, to swim with sharks) and use the media exposure to change public opinion. Amazing. PHD in marine science, surfer, free diver and spear-fisherman, Riley wanted to understand why sharks instilled so much fear in people and whether it was warranted. What he found was far worse – sharks are in rapid decline, receiving little sympathy due to their demonised stereotype. Through the combination of high-tech science and stimulating visual imagery, Riley explains how conventional scientific communication can move at the speed of modern day media to achieve conservational goals. Talk about interacting with the audience! Lesson for me: This was a deeper level of human connection on mass than I have ever experienced. I will never forget those moments that 2300 of us shared together. We were one. Leaving New Zealand in 1996 to go on his big OE, John returned to New Zealand with an exciting idea – to set up an interactive percussion business for the corporate events industry. In 2003 Rhythm Interactive was born, and it has grown to become one of the most innovative, interactive, and entertaining team building shows for the conference and events market in New Zealand. Since then, John has travelled throughout Australasia and Asia performing for thousands of people of all ages. Dave Boivin is a Transmedia Consultant and the founder of Deep Immersion, a New Zealand Transmedia solutions company. Cinema is Dave’s first love, a passion borne out of his days working long shifts at an Auckland multiplex. It was here that Dave observed first hand the powerful build-up and after-effect of the cinematic experience; he could see viewers searching for an opportunity to engage with the material before and after the screening. Long before Transmedia was a word, Dave began developing small stunt-based ‘happenings’ staged within the cinema complex that served to ‘compliment’ or ‘complicate’ the viewers experience of the film. And now – to cut a long story short – it’s what he does for a living. Deep Immersion helps creative producers and artists find exciting ways to give their stories life beyond the page, the stage, and the screen. Dave is constantly on the hunt for new narrative forms that can cross media platforms, embracing new audiences all over the world. Matt did the impossible, he created a restaurant that generates zero waste. Lesson for me: Just because a way of doing business is the way it’s always been done, doesn’t mean it will always be done that way. Change can happen (and must happen). Arguably one of the hottest chefs on the Australian dining scene, it’s not rare for foodie fans of Matt’s to book tables 3-months in advance at Sydney’s Stanley St. Merchants where he’s head chef, or queue 100m down the street at Greenhouse, a Perth eatery which was named Restaurant of the Year in 2010. Matt’s an Aussie that’s serious about food and sustainability – if it can’t be sourced locally, it’s not on the menu. Greenhouse, Australia’s first all-recycled restaurant is a place where foodies can touch natural materials, understand where everyday fresh food comes from and taste food straight from the garden. Lesson for me: It made me realise that “impossible” is an individual thing. The list of things impossible for the human race is short or maybe even zero, but the list for you and I is long. Or is it? Like he said, think of something that is impossible for you. And now go do it. Vaughan is the CEO and Founder of Vend, maker of awesome cloud based retail software and champions for small to medium retailers worldwide. The Vend team hold 3 core values dearly to their hearts, to delight retailers, to do the impossible, and to take care of one another. Every year Vaughan personally walks the talk and does an impossible challenge whether it is cycling the length of New Zealand solo, building a $100M venture, or running 1,000 kilometers. Lesson for me: “The good thing about living in NZ is that you can ring anyone”, so true! And my favourite quote from him is “No-one had any concern for what could and couldn’t be done”, I love that! Adman-turned-filmmaker Luke Nola is founder of Luke Nola & Friends, an Auckland-based production company that creates and produces award-winning television formats that inspire, engage and educate kids all over the world. One of the most enduring formats produced is Let’s Get Inventin’, a multi-award-winning reality TV series featuring kids aged 8-14 years with amazing invention ideas competing to build their contraptions. The series is enjoyed throughout the world, screening in over 73 countries and is the first New Zealand children’s TV format ever to be licensed by the BBC in the UK. After losing her daughter Evie, who had a rare chromosome condition, award winning NZ Wedding and Portrait photographer Rachel Callander turned her talent to capturing the beauty and abilities of other children with ‘Super Powers’. Rachel has traveled the length and breadth of NZ meeting ordinary families being made extraordinary through the journeys their children are taking them on. Lesson for me: Do young leaders like Muskan develop inspite of their constraints or because of them? I don’t know. Maybe both. Muskan Devta is a bright, bubbly, and brave fourteen-year-old who has achieved much in her short life. Muskan was born with a medical condition called partial hemiplegia. Her right side is weaker than her left and for 13 years she had to wear a brace to keep her foot straight. Being a special needs child gave her a lot of challenges, but Muskan proved that she could overcome them by focusing on the positives. She has been an radio host, column writer and author of two books, including her autobiography written to raise funds for Starship Hospital; the book ‘I Dream’ is now part of her school’s Year 9 curriculum. With the support of her family, school, and hospital, Muskan is very successful today. David Downs and Jon Bridges are serial co-authors, after leaving university, they began their careers together in comedy, starring in comedy programme Away Laughing. After co-founding Auckland’s Classic Comedy Club their careers diverged. David went all corporate – working for Microsoft both here and in Asia before entering the public service, while Jon has been a presenter, writer, director and producer of TV and is also a sought-after MC and public speaker. While researching No.8 Re-wired, a compendium and celebration of New Zealand inventions which will be published by Penguin in September 2014, David and Jon became convinced that New Zealand’s pathway to achieving productivity matching that of our international peers lies through a rewiring of our famous No.8 Wire innovation mind-set. She talked about “amnesiac love buzz” which is an attitude we could adopt when you meet someone for the first time. Love them unconditionally, but be gentle in your approach because they have amnesia and they don’t know they love you as deeply back. Lesson for me: There are so many worthy projects, causes, and people to help, but I am one person and can’t do them all. My job is to help where I can, and I hope to inspire others to find projects they can start or help with. Sarah Longbottom is Creative Director of the Nga Rangatahi Toa Creative Arts Iniatiative in South Auckland, a mentoring and transition programme that connects top creative talent of Aotearoa with young people in alternative education. Sarah honed and flexed her agentic self in mainstream and residential youth justice classrooms, and was instrumental in the development of nationwide pedagogical leadership in alternative education. Both the excellence and inadequacies of our education system inspired Sarah to take her learnings and develop an innovative model of youth development based on the core values of love and acceptance, energy and creativity, and collaboration and community. Like I said above, the following 8 speakers are awesome, but they just didn’t ring my bells on a personal level at this point in my life. The people sitting next to me would have had a completely different experience. Waikare Komene is a young professional from Otara who is passionate about empowering communities from the grassroots up. Waikare is a qualified architect and is the driving force behind The Roots Creative Entrepreneurs. The Roots describes itself a “a creative business, a movement and a network,” and is based on the five values of roots, creativity, sustainability, intergenerational and community. It aims to empower young people by developing opportunities to showcase creativity, innovation, and design by educating young people from high school age up about environmental awareness and sustainability. Catherine’s mission in life is to inspire people to cook and eat simple, good food. A passionate foodie and Dish Magazine co-founder, Catherine is behind the Garden to Table Trust, a programme established to teach children aged 7-10 years how to grow, harvest, cook and share food. The programme ticks all the boxes that Catherine feels are important in the world right now: caring for and about the natural world, knowing where food comes from and how to produce it, and knowing how to feed ourselves and our families. Catherine hopes that through the Garden to Table Trust, children can go up knowing the basic skills, reduce waste, eliminate plastic and chemicals, and eat only fresh food. Natural, cheeky and straight-up South African-born, New Zealand-based, Urzila Carlson, took to the stage for the first time in 2008, and has since racked up an impressive array of awards for her stand-up comedy. Working with some of the most inspiring and influential business leaders of our generation, Rebecca is a top sustainability strategist who works with the likes of Sir Richard Branson to develop global sustainable business strategy. A systems thinker and scientist, she finds leverage points which, when activated, result in high impact, transformative and scalable models for individuals, business, cities and entire countries. Richard is now a professor and Head of the Department of Physics here at the University of Auckland. Richard’s work focuses on the physics of the very early universe and understanding the ways in which the universe changes between the Big Bang and the present day. Vivian is the co-founder of the exciting Loomio Cooperative, an organization born from activists in the Occupy movement collaborating with Enspiral, the social enterprise network. Vivian is passionate about working with other people to find scalable solutions to the wicked problems of our time: poverty, equitable access to education, clean water, and sustainable local economies. She brings experience in decision making, social change and a depth of knowledge in organisational systems. Vivian believes a whole new set of opportunities for the world arises from the intersection of online citizenship and democracy. Her personal mantra is that ‘a group of people with diverse experiences and perspectives will come up with solutions better than any one person ever could have’. Rebecca Wadey is a writer, fashion PR specialist, cancer survivor, mother and business founder. Since her diagnosis of breast cancer at 26, Rebecca has embraced a lifestyle of wellbeing as well as connecting with and supporting other women facing the disease. A chance friendship with raw foods “unbakery” Little Bird founder Megan May, buying a Vitamix and the essential addition of yoga marked a turning point in Rebecca’s journey and she has recently opened a yoga and wellness hub in Auckland. The Centre combines yoga, naturopathy, meditation, massage, accupuncture and nutrition and offers free programmes for women with cancer. Willie Jackson is one of the leaders for Maori in Auckland, and is also one of the country’s leading media personalities, a broadcaster, political commentator and talkback host for Radio Live and Radio Waatea. Willie was a Member of Parliament from 1999 to 2002 and has worked as a trade union organiser, record company executive and urban Maori advocate. In addition to his media roles, Willie is chairman of the National Urban Maori Authority, chairman of the 21 Iwi Maori Radio Stations (Te Whakaruruhau o Nga Reo Irirangi Maori) and chairman of the Maori Television Electoral College (Te Putahi Paoho). If so, which was your favourite and why?